A free duplicate file finder and cleaner software. Free Duplicate Finder is a free duplicate file finder and cleaner software to instantly scan your computer for duplicate files and list them for you to delete. You'd be surprised just how many redundant or duplicate files you could find forgotten in an obscure documents folder. Free Duplicate Finder will deep scan for all types of files include photos, music, video, Word documents or text files etc. If a file appears twice on your computer then Free Duplicate Finder will find it. Once these files are found you are provided with helpful tools to enable you to select which copies to delete or move. These files can be deleted to the recycle bin or moved into an archive elsewhere. Removing duplicate files will significantly free disk space on your computer. It will also help to speed up indexing and reduces back up size and time. Your computer isn’t fully optimized until you’ve removed all unnecessary duplicate files. Let Weeny Free Duplicate Finder remove the duplicate files! Free Duplicate Finder is our first software to use Windows Metro style interface. Your opinions about the interface are appreciated. Free Duplicate Finder works on Windows XP, Windows Vista, Windows 7 and Windows 10, both 32-bit and 64-bit versions. Click the download button above to download Free Duplicate Finder full version. Full version means the file is complete and comes with all the media needed to install and manage this software. Full version also means Free Duplicate Finder software doesn't have any watermark, nag screen, time expiration or function limitations. Easy to use - A couple of clicks to finish duplicate files scanning. Free to use - 100% free to download, install and use, no extra fee. Free Duplicate Finder - Find duplicate files in drives. Free Duplicate Cleaner - Delete duplicate files or move them into an archive elsewhere. Wizard interface - Wizard interface to guild you finish duplicate files scanning step by step. Fast Scanning - Fast scanning and accurate duplicate comparison. Over time, a lot of files get accumulated in our hard drives due to downloading content from the internet or copying files from our cameras and mobile devices. We often end up with multiple copies of the same files, which is pretty annoying as they take up valuable hard drive space without serving a purpose. It is extremely tedious to look for duplicate files manually by browsing every folder, and even then there is a chance of missing out on many. There are several tools available that allow you to locate and delete duplicate copies of files such as GDuplicateFinder and Fast Duplicate File Finder. Free Duplicate Finder is another application for Windows to help you locate duplicate files, and its lets you do so based on file type including photos, music, videos, documents, executable etc. When found, the duplicate files can be moved to a different folder, allowing you to decide if you want to delete or keep them. 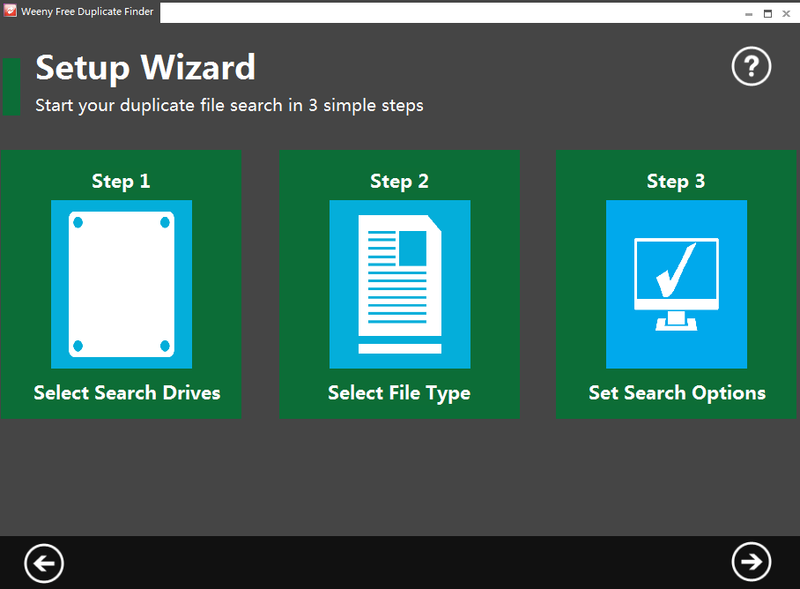 The application features an interface inspired by the Windows 8 Modern UI, and provides you with an easy, step-by-step wizard to search and remove the duplicate files. Step 1 involves selecting the drive. Next, you choose the file types to search for in the 2nd step. Finally, you specify your search options in the 3rd one. After launching the application, click the forward button in the lower right corner to move to the first step. You can choose complete drives to search for duplicate content. Do keep in mind that the application only supports NTFS partitions. Just select any drives that you want to scan, and hit the forward button. In the next step, select the file types that you want to scan the system for. You can select multiple file types as well. For instance, if you are just looking to locate duplicate media files, select the 'Music', 'Videos', and 'Images and photos' options. You can also search for Executable, Console, Documents, Archive, and Phone file formats. The final step requires you to specify the search options, including the search criteria and some filters. The app can find duplicates based on identical file names, identical contents and identical size. The filters are available for date & time, size and attributes to narrow down the search scope. Each filter has its own group of settings to specify. For instance, if you choose date and time filter, you can look for files that were created, last modified or last accessed within a certain time frame. Once the search is complete, a graph is created with a different bar for each of the file types found in the search results. The list of duplicate items can be accessed with each original + duplicate item grouped together separately. You can choose to view a file in Explorer, delete the selected files, or move them to another folder. Free Duplicate Finder works on both 32-bit and 64-bit versions of Windows XP, Windows Vista, Windows 7 and Windows 8. As its name suggests, Weeny Free Duplicate Finder is a handy and reliable application designed to help you easily find and remove duplicate files on your computer. The application performs a deep scan of your drives and detects all the duplicate files, including photos, music, video, Word documents or text files etc. Once the files are found, you are provided with tools for delete or move copies. Weeny Free Duplicate Finder is a program that helps you find duplicate files on your computer. With a simple scan, multiple files are identified to easily delete them afterwards. The interface is built in a wizard-like form. Yet, you should pay attention because additional programs ask for your permission to be installed. Working with the program is not complicated at all; you simply select the drives that will be scanned for duplicate files. Once the program finishes the scanning process, you are endowed with useful options to select the files you want to delete or move to a specified folder. Weeny Free Duplicate Finder allows you to scan for any type of files. You can search for documents, photos, music, videos, archives, etc. An option that I like is searching for duplicate files saved on your computer at a definite period of time. Specifying the time interval shortens the waiting time. Since this application is not one of the fastest scanning tools, I advise you to take into account the above mentioned searching criterion. The intuitive interface, consisting of three simple steps to follow, is of great help. Finding duplicates is not limited to a shallow search criterion such as 'identical names' of files; the content and the size of files are the relevant search options. This program helps you keep your computer clean, without any redundant files that might slow it down. + Helps you find duplicate files. + Keeps your computer clean. + Additional settings for duplicate file search. - Scanning takes quite a long time. - Only NTFS formats are supported. Weeny Free Duplicate Finder is a free duplicate file finder and cleaner software to instantly scan your computer for duplicate files and list them for you to delete. If a file appears twice on your computer then Weeny Free Duplicate Finder will find it. Once these files are found you are provided with helpful tools to enable you to select which copies to delete or move. Weeny Free Duplicate Finder has elegant Windows 8 style interface and it's very easy to use. A wizard will guild to finish duplicate files scanning step by step. Weeny Free Duplicate Finder is a freeware meant for users who want to free disk space on computer by removing duplicate files. Weeny Free Duplicate Finder (product of Weenysoft) is a freeware for Windows that allows to search and remove duplicate files from hard drive and helps to gain a bit of disk space. 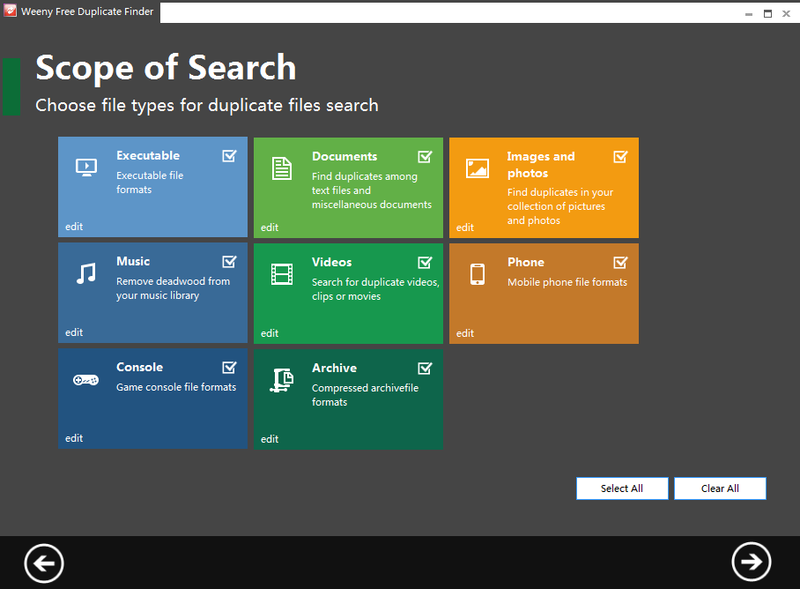 You can include executable files, documents, image & photos, music, videos, archive files, and game console file formats to search for duplicate files. After completing the search process, this duplicate file finder will show results in a graph showing you number of duplicates found for each type of file format. After getting the results, you can select unwanted files to remove. If you don't want to remove files, then it also provides option to move selected files to a particular folder. Weeny Free Duplicate Finder is quite easy to use and helps to search and remove duplicate files in a step by step manner. Thus, it provides a simple wizard that is very useful from selecting hard drives to removing duplicate files. Moreover, it's a very lightweight software as well, so it won't use much of CPU resources. You can see main interface of this software where it provides a Setup Wizard and Next arrow icon to complete the Setup Wizard and remove duplicate files. The very first step you need to perform is select a hard drive or all the drives of your PC and move to next step. It does makes sense to select all the drives, as it could be possible that a file on one drive has duplicates on another. In the next step, simply select those file types which you want to search for duplicates. For example, you could limit your search to: music files, executable files (like *.exe), videos, archives (*.rar, *.zip etc. ), image & photos, and more. After selecting file types, you have to set search options in the next step. This is one of the important step in which you can adjust search criteria and can add filters (filter files by attributes, size, and date & time) to search for duplicate files. In the same manner that you specified search criteria in previous step, here you can enable options to find only identical size/contents/names file. That's all you have to do. After that, you can hit the available search button to start the search for duplicate files. Once search will be completed, you can view the Statistics in a graph. This graph will show you number of duplicate files for a particular file type present in your PC. After finding the results, you can hit the 'Duplicate file Details' icon to view duplicate files. Select files to remove them from PC or to move them to a folder. - Provides a beautiful interface to search and remove duplicate files. - A simple step by step process is needed. - You have the facility to select file types of your choice. Hence, it is useful to limit search to those file types that take up most of the disk space, like: video and audio files. - You can also move files to a folder if you don't want to delete them. - It's a lightweight software and its size is 2.37 mb. - Use it completely free. Weeny Free Duplicate Finder is a nice software using which you can search all of hard drives of your PC for duplicate files. Moreover, as you can select file types to search for a particular type of files, it makes search more effective. Use it now and free up some precious hard drive space. Duplicate files not only waste precious storage space, but can also make your PC dead slow by increasing search time. So it's a good idea to periodically delete all those duplicates. There are tools like Weeny Free Duplicate Finder that make the task of finding and removing duplicates a breeze and it works on both 32-bit and 64-bit versions of Windows XP, Windows Vista Windows 7 and Windows 8. Free Video Converter A free video converter software to convert video files between many formats. Free Video Cutter A free video cutting software to cut a big video file into small pieces. Free Video Joiner A free video joiner tool to join multiple video files into one large video file. Free Word to PDF Converter A free PDF converter software to convert Word doc and docx to PDF. Free PDF Cutter A free PDF cutter software to cut a big PDF document into small pieces. Free PDF Merger A PDF merger software to merge multiple PDF files into one big PDF file.